The Fort Ward Community Hall project has been awarded a $1,000 grant from the Washington Trust for Historic Preservation. 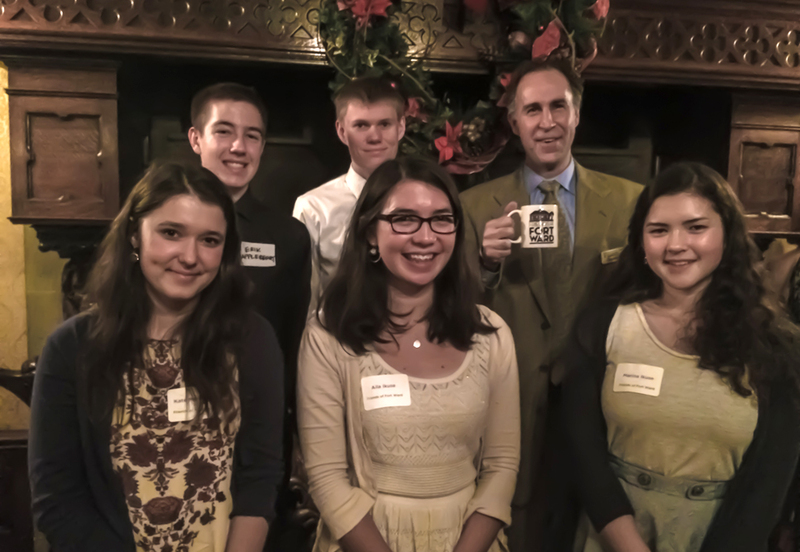 The Fort Ward Youth Advisory Committee with Chris Moore, executive director of the Washington Trust for Historic Preservation, before the great hearth of the historic Stimson-Green Mansion in Seattle. The WA Trust grant was awarded a holiday gala Dec. 9. Moore was presented with a Friends of Fort Ward mug (pictured). Awards are given in the name of Valerie Sivinski, a preservationist who died in October 2000 while performing preservation-related work. Sivinski was a longtime WTHP board member who served as president in the early 1990s. Chris Moore, WTHP executive director, noted the demonstrated level of community support and coordination for the Fort Ward Community Hall project as key factors in the grant committee’s decision to award funding. Other projects earning Sivinski grants announced this week include the 1926 fishing vessel Commencement built in Gig Harbor, the 1866 Haller House in Coupeville, and the 1880 Kirkman House in Walla Walla. In total, nine projects across the state received $10,000 in funding through the Sivinski Grant Program. The grants were awarded Dec. 8 at the Trust’s annual holiday gala at the historic Stimson-Green Mansion in Seattle. Douglas Crist, Friends of Fort Ward board member, thanked the WTHP for the Sivinski grant funding. The restored building will include an 1,100-square-foot central hall for meetings and classes, with an adjacent kitchen facility. It will join Seabold Hall, Island Center Hall and Camp Yeomalt among local historic buildings that have been preserved for public use. Kitsap County (Fort Ward) Sewer District No. 7, which purchased the building in 2007, will maintain ownership and keep a small corner office for management of its utility operations. The rest of the building will be managed and programmed by the Bainbridge Island Metro Park and Recreation District under an interlocal agreement. Fundraising for the restoration project is ongoing, and community groups and potential donors can arrange tours of the building by emailing fortwardhall@gmail.com. For more information on the Washington Trust for Historic Preservation and the Valerie Sivinski Washington Preserves Fund, see www.preservewa.org.